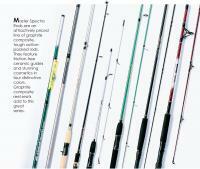 Surf And Salt Water Fishing Rods Master Spectra Rods are an attractively priced line of graphite composite, tough action packed rods.Okuma Tundra are quickly gaining a reputation as the surf rods that can take a beating day after day, Shimano FXS series created for anglers of all ages, cover a wide variety applications and lengths. Calyapso Seahawk features a fiberglass blank, aluminum oxide guides, graphite reel seat with stainless steel cushioned hoods, and a EVA handle with diamond wrap. Contact us. for more information.